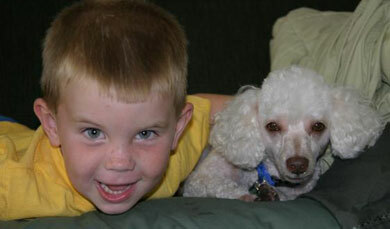 Coastal Poodle Rescue - We Save Dogs' Lives! We were officially established on March 8, 2004, with no money but a lot of heart. We are a non-profit 501(c)(3) corporation. We are 100% volunteer-run, and we "poodle" in our spare time. But we've accomplished a lot. Sparky with His New Boy! Some information for you to consider. With your help many more 'Sparkys' can be helped. Deceased, means CPR cared for a poodle for it's last days and it never left foster care. You can see below details on the timeframes these dogs are in our care. It is sad but a very important part of what CPR does, CPR cares for all our dogs until it is their time. When CPR takes in a dog, we don't just take healthy dogs, we take 'poodles and poodle mixes'. Sometimes the dogs we take in have medical issues which cannot be 'overcome', like liver disease or cancer or pancreatitis or something like that. With good care these dogs can live a happy life for their last days, sometimes they are put up for adoption with 'special needs' and sometimes they are not put up for adoption. As the numbers below show, they can be in our care for quite awhile. Donations are used to support the medical needs and care of these dogs. We do the best care practical given each situation. You can read some of our stories on these dogs from their foster mom's or dad's at the http://coastalpoodle.petfinder.com website. Foster, means CPR is currently caring for this number of dogs, these are either available on the website now or in the process of being cared for to become available for adoption. Permanent, means CPR has this number of dogs in our care (not included in the foster number) that will NOT be put up for adoption due to one reason or another. New, means the dogs are signed over to us and pending a foster home (are being boarded somewhere or in a home pending room). Pending, means the adoptions are pending on this number of dogs. Why do rescue groups like ours ask for funds? What happens with those funds? Let me give you some sobering statistics. Just remember you are looking at one rescue operating on the eastern coast of Florida, handling poodles and poodle-mixes only. More dogs are arriving into rescue every day, we turn away dogs every week, it just kills us to do that but the facts are clear we can only support so many dogs given the financial and human resources we have. 12% of the total number of dogs we have are still in our care. If you can spare the funds and help us, please donate in some form. We assure you the funds we receive go to the care of animals or to run the organization, fundraisers, etc.. We have *NO* paid people, we are 100% volunteer. One person can make a difference to a group like ours, one foster can be a home for several dogs a year, financial donations accumulate to pay the bills.